BOUNTY CAMPAIGN IS NOW ACTIVE, JOIN TO EARN TOKENS! 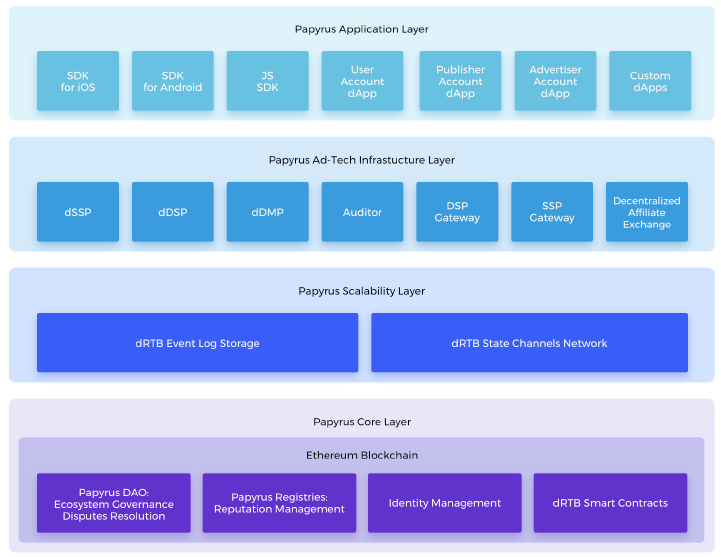 Papyrus is a world’s first highly scalable decentralized ecosystem for digital advertising, which includes full stack of open sourced components for programmatic advertising in decentralized environment. Papyrus mission is to create global digital advertising ecosystem, which will unite users, publishers, advertisers and decentralized application developers by providing totally transparent, fair and efficient advertising value distribution. Papyrus strives towards accelerated growth of advertising market efficiency and everyone’s economic wealth and comfort. Who Will Benefit From Papyrus? Users will be able to control what ads they see and what data they share with advertisers. There will be no abusive ads and malvertisements. Most importantly, users become full-fledged members of advertising ecosystem and are instantly compensated for sharing their data and responding to advertising. Thus users get new comfortable Internet environment at their service. Traditional web and mobile publishers and dApp developers will receive higher revenues by transparent advertising demand and benefit from instant payment settlements on blockchain. dApp developers will be able to easily create ad-based economies by utilizing ad monetization inside their apps. They will also have an opportunity to promote their dApps and token offerings via Papyrus ecosystem to the consolidated user base of existing dApps. 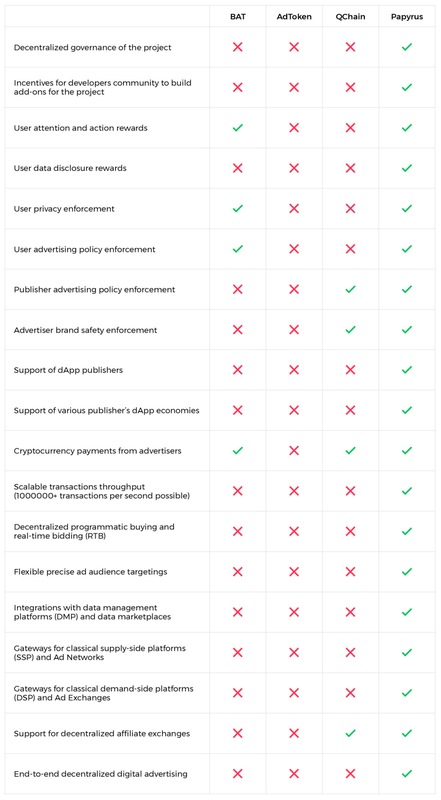 Advertisers will benefit from the high quality traffic, as Papyrus decentralized reputation and antifraud solutions protect them from non-human and fraudulent traffic by an order of magnitude better than traditional solutions. All ad data is securely stored in scalable decentralized storages enabling traceability of all operations and eliminating fraud within ad buying intermediaries. Transparent environment with real-time advertising payments significantly reduce technology costs comparing to complicated traditional adtech solutions. 1. Ethereum blockchain and smart contracts. 2. State channels network for transactions performance scalability. 3. Secure and scalable decentralized data storage for event logs. 4. Blockchain identity and reputation management systems. 5. Decentralized real-time-bidding (RTB) protocol based on OpenRTB. The architecture of Papyrus consists of 4 layers. Components of each layer are developed by the Papyrus team as open source software for the ecosystem growth and adoption. 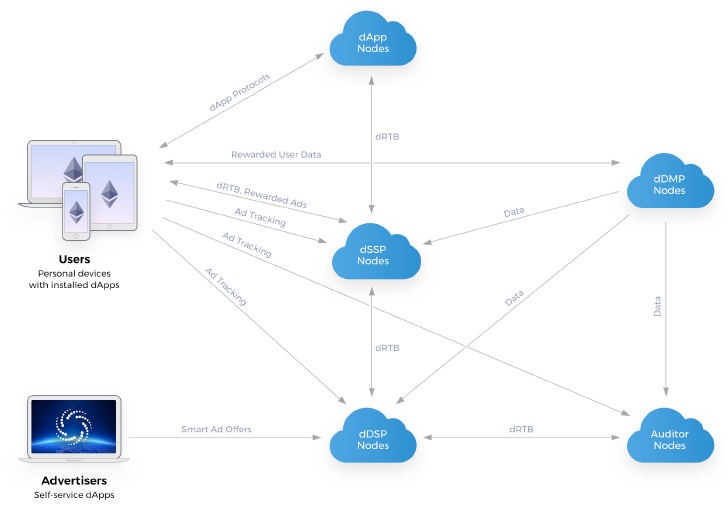 The Papyrus AdTech Infrastructure layer includes all components required to establish a complete digital advertising cycle within the Papyrus ecosystem and to create gateways with traditional adtech systems. Scheme of basic communications within dRTB cycle can be views as follows. You can learn technical details about Papyrus in our Whitepaper! How Is Papyrus Better Than Other Solutions? There are already several projects that aim to leverage blockchain technology in the area of digital advertising. Each of them focuses on a very specific subset of problems not transforming the existing advertising landscape strategically. The following table summarizes the key features of the projects in comparison to Papyrus. PPR is a utility token based on the Ethereum technology that is used as a unit of account between advertisers, publishers, developers and users in the Papyrus ecosystem. * private sale phase 2 for accredited adtech companies, which will happen not earlier than in 2019 after Papyrus ecosystem get substantial traction on the advertising market. More team members can be found here. Hello! Let me reserve the translation of the bitcointalk Russian thread/site/whitepaper. Reserving Turkish translations if needed. Concept is quite similar to ADEX where they are based on monetizing ads for advertisers and letting users choose the content they need to see. Please note that reservations will only be accepted after the Bounty campaign is announced. We will look into all applications. Please feel free to join our social media and subscribe to our newsletter in order not to miss the BC start. Here is a comparison to the key market players, for your interest. 2) Papyrus has one more important advantage: it is the first solution with a scalable RTB realization (with the help of state channels). This means that Papyrus will be able to work with tramendous amounts of ad transactions in real time. 3) We are developing the first complex solution, which is an ecosystem for the advertising market, governed in a decentralized manner as a DAO by token holders. It is not a solution for just a couple of ad processes. It is a complex one. Why the dev is just a newbie?Any information about your team? This is a newbie account because we wanted to maintain the name of the company without asking any third party to create the topic. We believe that this creates more trust. Reserve Filipino translation if needed just contact me. We are taking part in CoinAgenda conference in Barcelona! If you want to schedule a meeting, drop us a message to info@papyrus.global. Thank you! As a major Undertale fan, I must say, the name of your project is just amazing! Was half expecting to see a logo with a tall skeleton on it. A review and photos of Day 1 at the conference CoinAgenda in Barcelona - read it in our blog! This is kind update overview of day 1 this conference. Comparison chart with other competitors showing this project has clear and offering more better solution so I will keep follow this thread for more details and news in future.